Don’t miss our chapter’s most fabulous event of the year – The Book & Author Luncheon, featuring three authors, to be held at the beautiful Crosby Club on April 4, 11:30 a.m. See reservation form in the Bulletin, March – April 2019. All proceeds will go to Magnify the Mind in support of research into neurodegenerative diseases. Our UOW event was a wild success! Check out our January-February bulletin for more to come. Chin’s Szechuan Cuisine, 625 Encinitas Blvd., Encinitas – December 6 at 12:30. Don’t miss the party! Entertainment by Cara Freedman with her guitar singing from the Great American Songbook and favorites from the 1920’s through the 1970’s. Please bring an unwrapped holiday gift for the children at the Family Recovery Center. A New Year and new activities! Study Groups begin in October, and special events are already on the calendar. From University on Wheels and the Book & Author Luncheons to a Chinese-themed Chanukah party and a Soup Exchange, you won’t want to miss a thing. We look forward to seeing you often this Brandeis year. Welcome to the Study Group Issue of the bulletin! BNC San Dieguito hopes all of our members are having a fun, relaxing summer as we transition into a new BNC year. Chapter leadership has been working hard to organize a variety of events and study groups for the entire year, and they’re finally here! In this issue of the bulletin you will find details about the study groups being offered this year, the Annual Open Meeting and Showcase Luncheon, registration forms, important contact information, and details on a new neuroscience based initiative. Check out all the excitement! Here’s to another great beginning. 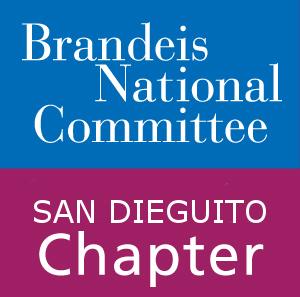 Don’t miss our annual Opening Meeting/Study Group Showcase luncheon at the Lomas Santa Fe Country Club, Solana Beach, Wednesday, August 29th at 10:30 a.m. Study group leaders and coordinators will describe their groups, and members are urged to invite friends to this first social event of the year. Guest speaker, Hannah Cohen, author of Remarkable Women of San Diego: Pioneers, Visionaries and Innovators. Please bring a donation of canned or boxed foods for Jewish Family Service, our community project for the year. Send $36 to Suzie Kaplan by August 20. See the July-August Bulletin for menu and details. Brandeis University has been awarded a $1 million, 5-year grant from The Howard Hughs Medical Institute (HHMI) to aid in fostering undergraduate diversity in the sciences. The funding will help the Brandeis support undergraduates in STEM fields — science, technology, engineering and mathematics — especially those students who are first generation college students, from low-income backgrounds and military veterans. Brandeis is one of 33 institutions of higher educations to receive the HHMI Inclusive Excellence award this year for its commitment to increase its capacity for inclusion. Part of the funding will be used to continue the success of the Science Posse program which focuses on attracting and retaining talented, underrepresented student in science. Another part of the grant will go towards the Galaxy Program, a mentoring program intended to provide extra support and guidance to undergraduate students in the early stages of a scientific education. These programs, as well as initiatives enabled by the grant, will further Brandeis’ commitment to social justice by helping all talent shine through in the sciences field, regardless of background. We would like to thank all of our BNC members for your continued support of Brandeis’ sciences and libraries. Your generosity makes it possible for students from all walks of life to excel even when grants are not available. As we officially enter summer, we hope all our members have some time to kick back and enjoy the sun. What better way to enjoy the warmth (or the AC) than with a good book? Brandeis University has released its list of summer reading recommendations from various professors and librarians. This extensive list ranges from historical and political analysis, to graphic novels and crime thrillers. The Politics of Resentment: Rural Consciousness in Wisconsin and the Rise of Scott Walker by Kathy Cramer and recommended by Jill Greenlee, Associate Professor of Politics. See the original article for further details about each book. Our own Stan Schatt, author of over 40 books, Renaissance man, and Brandeis study group leader extraordinaire, will present a special program featuring his latest book, Here Come the Robots! From industrial helpers to women working in brothels (!) will robots become a danger or a help, and will they change American society and culture? RSVP with a $10 check (made out to BNC) sent to Sharon Kroopkin, 2322 Masters Road, Carlsbad 92008 by June 22. Come enjoy coffee, tea and bagels and a fascinating talk.